Are you having hard time finding someone reliable to do your single braids in the Dallas or Grand Prairie, TX area? Beauty Concepts Salon is the best when it comes to any African braiding style and our prices can’t be beat! Give us a call at 817-724-9059. Single braids are done using a technique that includes long or short extensions used to braid the client’s hair from the scalp to the end of the braid. They are a great protective style for natural or relaxed hair that allows the hair to rest and and recover while maintaining a sleek appearance. 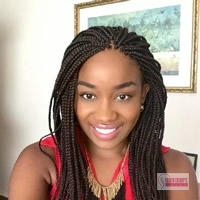 Also called individual braids, it is recommended that clients leave these extensions in no longer than six weeks to avoid matting and potential locking. Clients may wash their hair as frequently as desired. These braids can be styled in a ponytail or any up do that you desire. This style typically takes between three and four to complete, but it can vary depending on the client. When it comes to African hair braiding, there is no one in the DFW area that is better than Beauty Concepts Salon. So when you’re looking for high quality single braids in Dallas and Grand Prairie, TX, be sure to call us at 817-724-9059. Schedule your appointment today! Updated on August 4, 2016 at 2:50 pm by Beauty Concepts Salon.